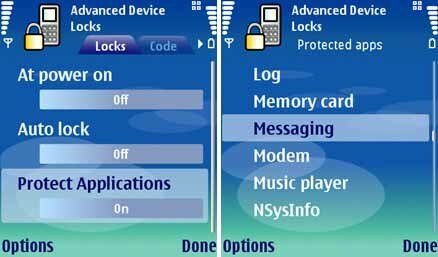 Free download latest version Advanced Device Locks for Symbian. It is a mobile security application. If you feel hesitation to give mobile to your friends then feel free to give them now. It is developed by Melonmobile. Advanced Device Locks will give you the full security of your mobile. Your friends will not be able to open and read messages, no one can check your mobile phone in your absence if any once do this then you don’t need to worry about it. With the help of this app you can lock your all applications like; Messages, Gallery, Contacts, Web browsing and Important notes etc. You can lock your phone, in this way all personal data of yours like videos, photos, messages, contacts etc, all will be saved. It will automatically lock your phone and it will be activated all the time; when you switch on your mobile, when you change the SIM card, after some specific time inactivity and when somebody tries to access your personal data or important protected application. Advanced Device Locks is very easy to use, after the installation of this app, you have to create a code or password and ‘0000’ is by default lock code and you must change it and set your own code for fully protection. After that it has flexibility to use like you can choose an option from one of these; Every time it is turned on, If SIM card is changed, if someone accesses the applications, you can lock some selected applications or your phone, and even you can check all these option for maximum security.